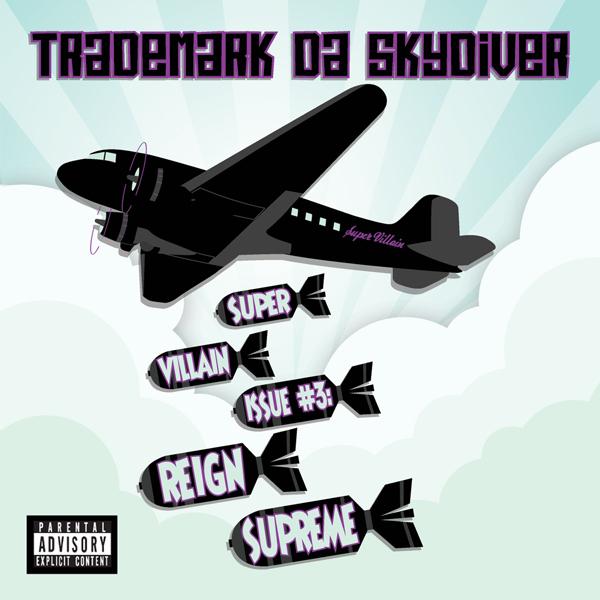 With the release of his forthcoming album, Super Villain Issue # 3: Reign Supreme approaching, Trademark Da Skydiver had the chance to come to New York and discuss his work ethic, upbringing, and lifestyle. The Jets Int’l member spoke about how he’s honed his songwriting ability since the release of his first mixtape and why Issue # 3 is vastly different than anything he’s released in the past: in large part, he says, due to recording all of Issue # 3 in New York with legendary producer Ski Beatz (Jay-Z, Curren$y’s “Pilot Talk” & more). He goes on to talk about why he’s chosen the Super Villain persona, “I’m a gangster and a gentlemen I guess you could say, or a villain and a gentleman”. The quiet weed-influenced rapper then explains how growing up in New Orleans, where seeing craziness was the norm, shaped his life. “Up Here” featuring Terri Walker & Produced by Ski Beatz. Wonderful blog! Do you have any tips for aspiring writers? I’m hoping to start my own site soon but I’m a little lost on everything. Would you suggest starting with a free platform like WordPress or go for a paid option? There are so many options out there that I’m totally confused .. Any tips? Thank you! Very nice post. I simply stumbled upon your blog and wished to say that I’ve truly enjoyed browsing your blog posts. In any case I will be subscribing for your feed and I’m hoping you write again soon! Awesome blog! Do you have any hints for aspiring writers? I’m planning to start my own blog soon but I’m a little lost on everything. Would you propose starting with a free platform like WordPress or go for a paid option? There are so many options out there that I’m totally overwhelmed .. Any ideas? Cheers! Alright, you’re suitable friend, each day updating internet site is definitely essential in service associated with Search engine optimization. Wonderful conversation continues this. All right, you might be appropriate friend, everyday modernizing website is really essential in support from Web optimization. Nice conversation will keep it up. Okay, you will be right friend, each day replacing site can be essential in help connected with Web optimization. Pleasant discussion makes this. Looking For Discount Mixtape Promotion checkout http://www.MixtapeBiz.com to get awesome deals . I like this blog very much, Its a real nice berth to read and obtain information. “Being powerful is like being a lady. If you have to tell people you are, you aren’t.” by Margaret Hilda Thatcher.